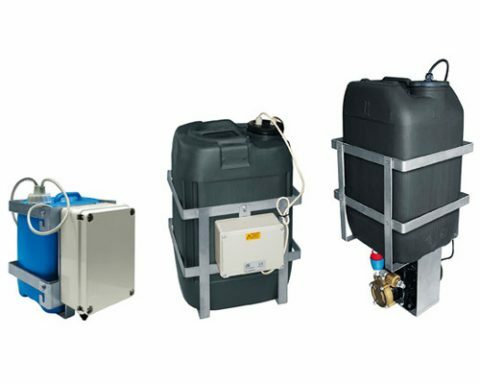 The Videotec WAS-WASPT is a wash kit consisting of a water tank with an integrated pump for PTZ cameras and camera housings equipped with wiper. This wide range of washers and tanks is available with capacities of 5 or 23 liters and delivery heads up to 30 meters. With the WASPT series it is possible to remotely control via RS-485 the wiper and the washer pump by using the DTWRX optional board. In the 11m (36ft) and 30m (98ft) delivery versions the lack of liquid in the tank is signalled following the automatic stop of the pump (except for 11m version of WAS series). Pumps with 30m (98ft) delivery are available only in 230Vac or 120Vac. With the use of the antifreeze liquid the minimum operating temperature goes down to -25°C (13°F).